It's been a musical couple of days here at the studio! We had an excellent time with Gary Mills last night and were surprised today with the appearance of Rocket Rocketship on the wharf for an impromptu filming. The picture below features some of our favorite Parks gals with the band, who also performed last night at Lobster Cove Head. In food news, we are back to serving lobster sandwiches! The first few days have been crazy with orders and we have sold out of lobster within the hour- so come in as quick as you can. All of our lobster comes from the local fishermen in the bay, so it's not only tasty, but super fresh, too! 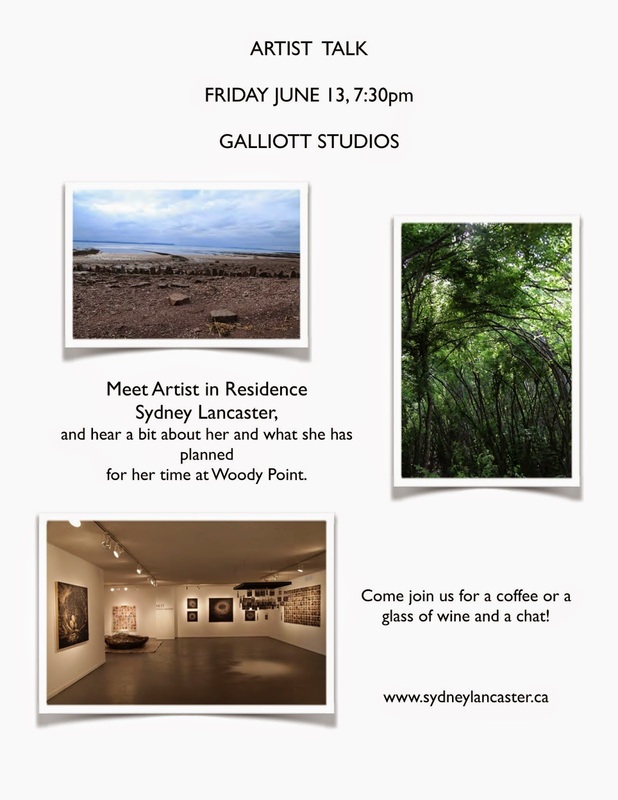 Hi, Galliott Studios fans and friends! Guest blogger and honorary Galliott Girl Evangeline here! I'm back in Newfoundland and working in Rocky Harbour at Java Jacks after nine long months of winter and psyched to be at the studio, drinking inhuman amounts of hot chocolate and goofing around on the pottery wheel. We have tons of exciting events coming up and some really interesting art coming in, so keep checking back all Summer for new reports on the coolest studio this side of the bay. Of course, our big news this week was our very cool wine tasting. Our first, but certainly not our last! It was catered by the very talented (and friendly!) 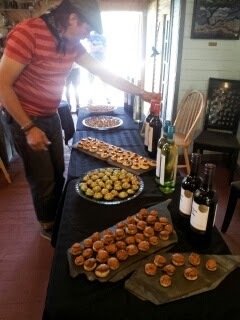 Jason Nesbitt, the chef at Serenity on the Rocks up at the Red Mantle. Delicious food and wine was enjoyed by all last Friday night. 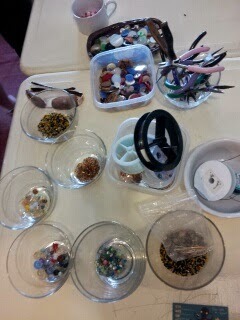 We also had a group of girl guides in just yesterday, making jewelery and enjoying the lovely, sunny day here. If you have a group of kids, or even just one or two, let us know! With a few days notice, we can offer many different activities for kids to enjoy- so that you can have a cappuccino or two and keep the little ones occupied. Tonight, we've got a last minute rock concert of our own happening with Gary Mills at 8 PM. Five dollars at the door for entrance, and wine, coffee, and cheese plates available inside in addition to our brand-new lobster rolls, starting at noon every day! They go fast, so come in as soon as you can to grab a bite to eat. That's all for today, but look for more posts soon! It's shaping up to be a great summer already. Here at Galliott Studios we like to go with the flow of summer, and when a wine rep came into the shop telling us about all the new wines we figured here is a great opportunity! So this Friday (June27th) at 6pm with the help of local chef Jason Nesbitt we will be hosting a wine and food tasting. If you would like to join in on the fun let us know by calling the shop 709-453-2142 or drop on in. Also this Sunday kicks off of our Sunday night shows. Every Sunday at 8pm until August we will be hosting different musical talents. This Sunday June 29th we have Gary Mills. We've attached a picture below....The show starts at 8pm and were looking forward to seeing Gary perform for the first time at the studio! manage, and understand expanses of space and time"
1. John and I will be onsite at Green Point by 9 am, latest, to get set up; high tide is at 8 am, so we will be able to access the Cambrian-Ordovician boundary strata and that bit of beach by then. 1a. Volunteers will arrive at 9:30, and we'll do a short briefing. 2. We will be setting up two cameras onsite: one on the grassy cliff above (for video), and one on the shore (for time lapse stills) . 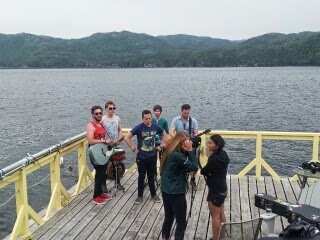 There will be a two more cameras available for stills and video from various locations as well. 4. We will stay on the rocks and continue with the documentation until the tide comes back in and the sculpture is toppled. (high tide in the evening is about 9 pm). Folks are welcome to stay onsite with us if they like! This Friday we are excited to have the new artist is residence Sydney Lancaster talking about her art practice and aspirations for her park residency. 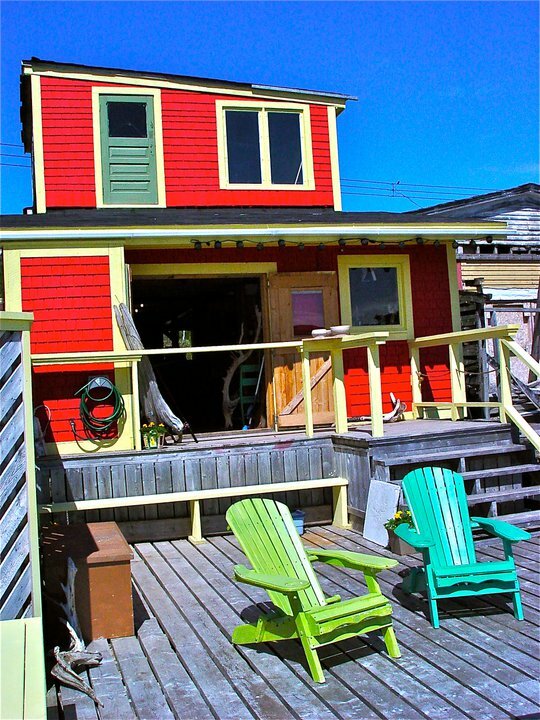 Spring is finally here and the Galliott Studio crew are supper excited! We have bands lined up for every Sunday in July, Artist talks, new author readings and more!! We started this season off with an Artist show of resent works by Kristen Oravec. 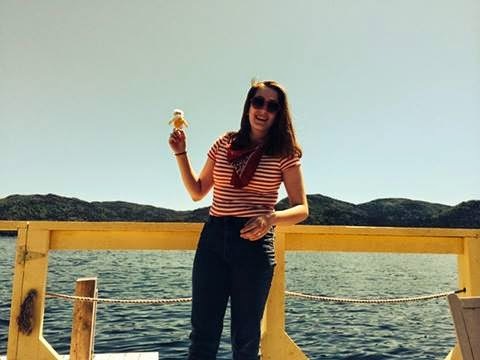 Kristen (or Kris as we know her) is a working visual artist, geologist and parks naturalist here in Gros Morne National Park. Her show " This Particular Silence" went up on the 30th of May and will be up until the 13th of June. We would like to thank everyone that came out to help use celebrate the opening! "Each place holds its own mood and silences. Bonne Bay and the neighboring Tablelands has its own particular silence that lingers in your belly long after you have left, a cool and reserved quietude. This cool stillness, which reveals no secrets, seeps slowly into ancient houses here, as slowly weather becoming more part of the land then artifact. I attempt to evoke that sense of cool quietude which one finds here through paint, the most fluid and silent of mediums. Hot colours are tamed and cooled by the use of strong horizontals. The use of restricted palettes and strong horizontals allow the viewer to settle into the sense of unpeopled silence, a place without cell phones, deadlines and iPads, an edge of reality where the soul and the land meet."